IBM has taken another step toward its ambitious goal of creating a processor that acts like a human brain, creating a second, more advanced chip that mimics the way the mammalian brain operates. “It’s a new landmark of the brain-inspired computers,” said Dharmendra Modha, IBM Research fellow and chief scientist focusing on brain-inspired computing. Researchers from Cornell Tech helped design this chip as well. The researchers describe the chip in this week’s issue of the Science journal. “Our architecture is designed to approximate the structure and function of the brain in silicon, while being efficient in terms of power,” Modha said. The processor could also be planted in large supercomputers to boost the speed of machine learning and other neural network-based computations. This is the second such brain-inspired chip that Modha’s team at IBM has created—the first one was made in 2011. 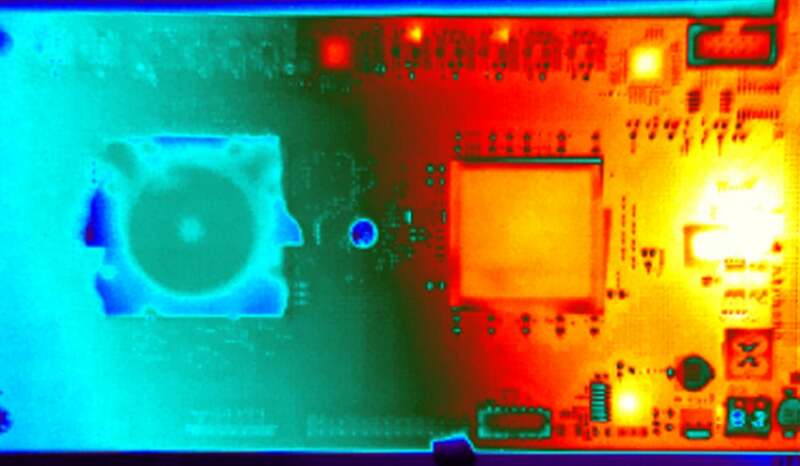 The IBM "TrueNorth" chip is designed for low power consumption, shown in this thermal image that shows the cool TrueNorth chip alongside hot FPGA chips that are feeding data to TrueNorth. The new processor, code-named “TrueNorth,” has 5.4 billion transistors woven into an on-chip network of 4,096 neurosynaptic cores, producing the equivalent of 256 million synapses, much larger than the 2011 design of roughly 260,000 synapses. IBM has also tethered 16 of these chips together in four four-by-four arrays, which collectively offer the equivalent of 16 million neurons and 4 billion synapses, showing that the design can be easily scaled up for larger implementations. The work originated in 2008 as a U.S. Defense Advanced Research Projects Agency (DARPA) project, under the project name of Systems of Neuromorphic Adaptive Plastic Scalable Electronics (SyNAPSE). The chips represent a radical break in design from today’s von Neumann architecture of computing, where computations are quickly made in a serial fashion. By working together, these cores could provide nuanced pattern recognition and other sensing capabilities, in much the same way a brain does. This chip architecture approximated how the human brain works, in that each “neurosynaptic core” has its own memory (“synapses”), a processor (“neuron”) and communication conduit (“axons”), which all operate together in an event-driven fashion. Like the brain, this chip requires very little power—only 70mW during typical operation, which is an order of magnitude lower than what standard processors would require to execute the same operations. Samsung fabricated the prototype chip using a 28-nanometer lithographic process. Requiring so little power—less than that required by a hearing aid—opens up a vast array of potential uses, especially on devices with limited power sources. For instance, a processor could be embedded in a mobile device or a sensor, where it could be trained to do object recognition on auditory, visual or multi-sensory data sources, a computationally intensive task that now requires a dedicated server. Such jobs could easily be done on a remote device itself, eliminating the need to stream video to a data center. “The sensor becomes the computer,” Modha said. The brain-inspired architecture is not designed to replace standard processors, but rather be used in conjunction with them, to tackle jobs that require lots of computation operations to be carried out in parallel. In the data center, the chips could be used in co-processor acceleration cards for running machine-learning neural networks, Modha said. Many machine learning algorithms now being commercially used could be easily adapted to this architecture, which could carry out highly parallel operations in a more energy-efficient manner, Modha said. IBM is still investigating how to commercialize this processor, Modha said, and has made no commitments to either manufacture the chip itself or license the design out to others. Modha said that, from early fabrication work, he saw no “fundamental risks” in producing these chips in large volumes. The company is also developing compilers and related software to make these processors easy to use.